We are happy to inform that Volume 24 with the special section “Sovereignty, Territory and Jurisdiction” has been published and is available for purchase on the website of Hart Publishing. Get 20% discount with this voucher. The rise of nationalism and populism in liberal democracies, the cold responses to humanitarian crises, as well as Brexit, and Trump have hit hard against ideals and principles that international lawyers have long – maybe too long – taken for granted. Solidarity, humanitarianism, cooperation, trusteeship, and responsible leadership are under attack. What will be the consequences? What is at stake and for whom? Should international accommodate, or become a force of resistance? With the 30th Helsinki Summer Seminar on International Law, Volume 26 of the Finnish Yearbook of International Law (FYBIL) offers a forum for discussing and reflecting on these matters, debate the issues, and formulate solutions to perceived problems. Those interested in publishing an article in the special section of FYBIL Volume 26 (The Ideal of the International – Principles, Backlash and Resistance) should submit their manuscripts by 31 December 2017. The manuscripts should not exceed 15,000 words in length including footnotes. 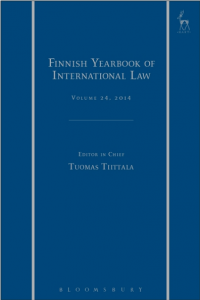 The Finnish Yearbook of International Law aspires to honour and strengthen the Finnish tradition in international legal scholarship. Open to contributions from all over the world and from all persuasions, the Finnish Yearbook stands out as a forum for theoretically informed, high-quality publications on all aspects of public international law, including the international relations law of the European Union.